"Sometimes it feels like my mind is just one question after another." IFC Films has released the chilling official trailer for an indie horror thriller titled Elizabeth Harvest, which first premiered at the SXSW Film Festival earlier this year. The film is the latest from Venezuelan filmmaker Sebastian Gutierrez (Elektra Luxx, Hotel Noir) and is about a woman who is about to get married to a brilliant scientist, until she finally opens the locked door in his home and discovers what's behind it. They don't reveal much in this trailer, but it seems to be a mix of body horror and psychological horror. 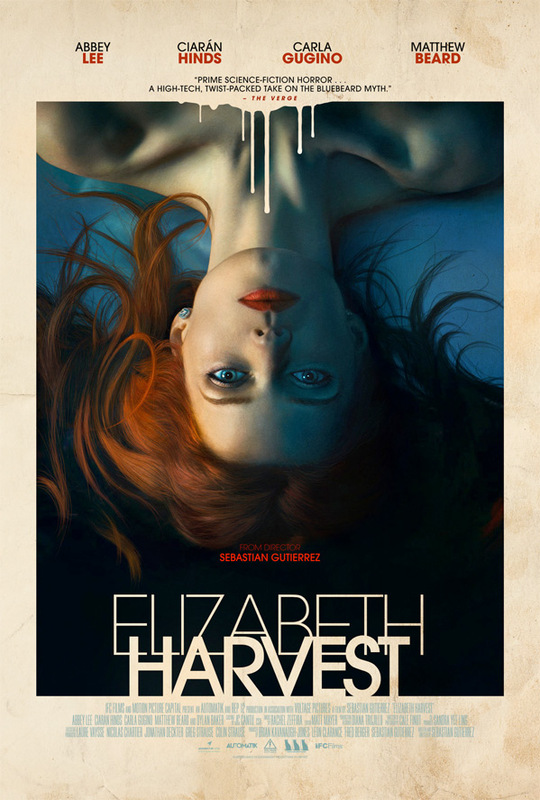 "Elizabeth Harvest casts a spell of creeping Gothic menace as it unravels a disturbing tale of identity, obsession, and twisted love." Abbey Lee stars with Ciarán Hinds, Dylan Baker, Carla Gugino, & Matthew Beard. This looks very unsettling. Newlywed Elizabeth (Abbey Lee) arrives with her brilliant scientist husband Henry (Ciaran Hinds) to his magnificent estate, where he wows her with lavish dinners and a dazzling tour of the property. The house staff Claire (Carla Gugino) and Oliver (Matthew Beard) treat her deferentially but she can't shake the feeling something is off. Henry explains that everything in his world now belongs to her, all is for her to play in - all except for a locked-off room he forbids her from entering. When he goes away for business Elizabeth decides to investigate and finds she may not be who she thinks she is at all. Elizabeth Harvest is both written and directed by Venezuelan filmmaker Sebastian Gutierrez, director of the films Judas Kiss, Rise: Blood Hunter, Women in Trouble, Elektra Luxx, Girl Walks Into a Bar, and Hotel Noir previously. IFC Films will release Gutierrez's Elizabeth Harvest in select theaters + on VOD starting on August 10th.